Recently, I posted an open question on Facebook: “What would you do if you won the lottery?” As you might guess, responses ran the gamut. “Donate to a charity.” “Get out of debt.” “Set up a college fund for the kids.” I chose a different route. I said I would find two accountants who didn’t like each other and hire them both. The result? I’d never have any accounting errors, there’d never be any embezzlement and each would do a wonderful job of identifying any flaws in the other’s recommendations. It’s a similar concept to what Abraham Lincoln did after he was elected president. As described in the book, “Team of Rivals: The Political Genius of Abraham Lincoln,” Lincoln brought together some rather resentful and disharmonious individuals and assembled one of the most unusual cabinets in presidential history. Although they rarely got along, they gave Lincoln their raw and straightforward opinions, which he could then sift and sort and make the decisions he needed to navigate one of our country’s most turbulent times. Had Lincoln surrounded himself with nothing but yes-men, I doubt he would have received enough information to make wise choices. Years ago, I used to sit on the board of directors for a nonprofit organization. There were about 14 people on this board, and we met once a month or so. In short order, I noticed one individual was always negative. No matter what was being discussed, this guy was a total naysayer. “That will never work. Here’s what’s wrong with that idea … That won’t work either, here’s why … ” Every time the guy talked, he was negative. After several months of observing this I went to the executive director of the nonprofit and said, “Why do you have this guy on the board? He is nothing but negative about anything that gets discussed.” The executive’s response was classic. “That’s exactly why I keep him around. He points out everything I need to do so that our plans can succeed.” Twenty years later I still remember that man’s response, and I value his wisdom. After all, plans fail for lack of counsel, but with many advisors they succeed. Think about it. Companies hire consultants and have boards of directors. Athletes, actors and singers have coaches, and so do successful business people. Even in 1624, the English author John Donne penned the now-famous line, “No man is an island” as he highlighted the interconnectedness of humanity. What about you? 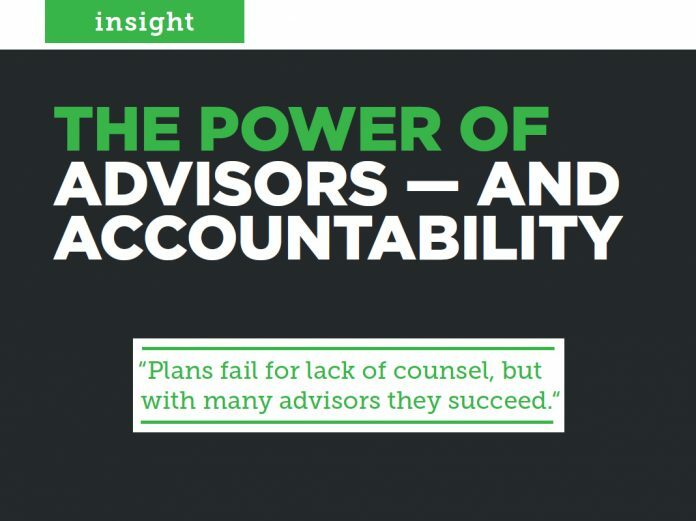 Aren’t you deserving of advisors? The answer, of course, is yes. After all, no man is an island. Everybody needs a listening ear, and accountably is a powerful tool. I was fortunate to have my first mentor nearly 30 years ago. The late Alex Goodman spoke much wisdom into my life, both by word and example. In fact, the principles Alex taught made such an impact on me that I decided to make a career out of coaching and training others in those same principles. And, over the years, I’ve tried to practice what I preach by asking other people to speak into my life. When I maintain that practice, things tend to go well. When I let it slip, my life tends to show it! But it’s not just the principles that make a difference, it’s also the ongoing accountability. Regular accountability is essential for success. Want some research to back that up? The Association for Talent Development did a little study on the correlation of goal setting and accountability, and here’s what they found. If you consciously decide to achieve a goal, your chances for success are 25 percent. If you create a plan for achieving your goal, the likelihood of reaching the goal is 50 percent. If you add making a verbal commitment to someone, your likelihood of success goes up to 65 percent. If you set up regular accountability meetings with someone, your chances of successfully reaching your goal shoot up to 95 percent. I’d say that makes having accountability partners a very wise choice. Currently, I have four people in my life who serve as mentors or accountability partners in varying capacities. The reason? I want 2019 to be a very successful year for me. It doesn’t matter what kind of meeting structure you set up, so long as it works for you. And, it doesn’t even have to cost a lot. Let me give you an example. About 20 years ago, I had just moved to the state in which I now live, and I wanted some insights on a few things. After asking around, I identified a reputable businessman and approached him with the following proposition. I said, “I’d like to buy you lunch every other week. You can name the restaurant, but the topic of conversation is going to be me. All you need to do is ask me questions.” The man agreed. The conversations were fruitful, and he kept me on my toes! No man (or woman) is an island. If you want a mentor or coach there are organizations now that serve as brokerages for certified coaches. Or, you may want a mentor from within your company. Or, just an accountability partner of some type. No matter what you’re looking for, my one recommendation is take your time and find the right person. Of course, why stop at just one? There may be several areas of your life you want to work on. By the way, if you’re looking for some motivation for this, I won’t ask what you would do if you won the lottery. I’ll ask you the same question someone once asked me, “What would you do if you weren’t afraid?” Also remember that proverb: Plans fail for lack of counsel, but with many advisers they succeed. Daniel Bobinski, M.Ed. is a certified behavioral analyst, a best-selling author and a popular speaker at conferences and retreats. He loves teaching teams and individuals how to use Emotional Intelligence, and his videos and blogs on that topic appear regularly at www.eqfactor.net. Reach him at daniel@eqfactor.net.